An East Anglian Iron Age silver unit of Anted (attributed to the Iceni), c.AD 20-50. The coin has a dished profile with post-depositional wear and pitting/corrosion on the reverse face. ABC 1642/1645. 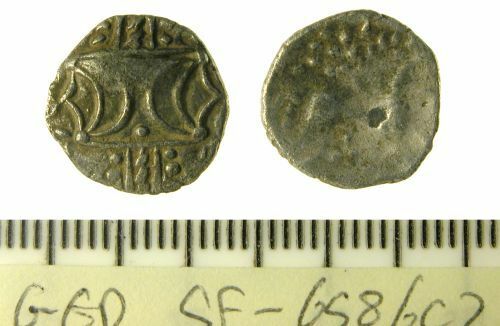 The coin listed above was found on arable land within the area of a previously known coin hoard of four Iron Age silver units reported in 2005 and 2006 (2005 T367; 2006 T112). As it is of comparable date and type to the coins in this earlier hoard, it is highly likely that it was part of the same original hoard that was subsequently dispersed in the ground by natural processes or ploughing. Reverse description: A horse right, above a pellet-ring with trefoil of pellets behind. Two pellets below tail, triangle of pellets below body. Silver unit of the Iceni, Anted type, heavilly worn, ABC 1642/1645, c.AD 10-30.